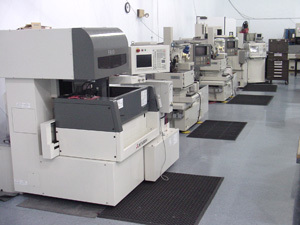 We have an operational base of 14 various state of the art EDM machines. Our latest Mitsubishi technology machine produces the finest finish at the least amount of time and at the least expensive cost. We evaluate each of our manufacturing requirements to determine the appropriate method of manufacturing. In many instances, traditional CNC Machining or turning will not result in the required precision mandated on the blueprint. When this occurs, we have the option to use the more precise EDM approach to comply to print requirements. When a heat treated part requires a precise hole on location, we usually opt for EDM. When the deburring process will take as long as the original operations, we use the burr free EDM approach or the Waterjet approach and save time and money! Keep in mind that in addition to being able to EDM cut conductive materials as hard as 70 Rc, tapered shapes are also possible. Complex precision components can easily be cut to unique shapes with high precision at a reasonable price. We work with a collective consciousness to find techniques to manufacture parts that customers felt were impossible. The EDM technology opens new doors of opportunity for engineers, scientists and designers. Precision EDM components have been conceptualized, fabricated, and delivered into Space many times as well as to Mars.